Home News My hand has been forced. The power of the big boys. Any one who has been following the progress of The Wainwrights in Colour book or may even have kindly purchased a copy from the website here or even attended one of the many talks that I have given around the country on the subject, may recall my pride and determination to make this unique book available either through my website or from independent or high street bookshops. I saw this as a way of helping to continue the footfall into these shops which are having a tough time of it at the moment, even if customers didn’t actually buy a copy of my book they may at least spend some of their money supporting local shops. There were times when I questioned my own decision, after all, many of us use the online retailers as a matter of convienience, goods ordered today can be with us the very next day, sometimes at a discounted price. An online presence may have helped in selling the 5000 copies of The Wainwrights in Colour more quickly but I stuck to my guns. Even though the book was listed on the main online retailer it showed as being “not available”, that was because I didnt supply them. However this did cause confusion on more than one occasion as I received emails assuming that the book was sold out. Most of the time I supplied local bookshops with stock of the books by delivering copies personally to their door, more distant shops had to purchase from a main wholesaler down in Brighton. I would receive an order from them, dispatch the books and then in turn they would send out the books to all corners of the country. All well and good. However, just last week I happened to be looking on the Amazon website and lo and behold not only were they listing the book as in stock but so were two other retailers, bookstores who obviously bought copies through the wholesaler and were selling on the site. This is something that I hadn’t planned for, maybe I had been naive? I cannot turn back the clock. The independent bookshops who I have supplied from the launch have had 18 months of clear sales without this online competition, after all, nearly all books are available online, The Wainwrights in Colour was perhaps the exception to the rule. So now I have to re-assess my sales plan. There is no going back, my mind is working out a way to still support those local bookshops who have supported me from the start as well as ensuring that the online sales are kept within my control where ever possible without discounting the cover price. I suppose it will be a case of “if you can’t beat them, join them”. I can understand your frustration Andy with the online juggernauts rolling over all in front of them with the arrogance that online is best, and the only retail option. 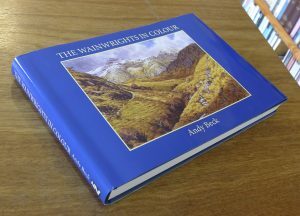 On the other hand, their keenness to get and sell stock of Wainwrights In Colour, through their online services to my mind in an endorsement of your book and project as a unique record of probably the most beautiful region of England, coupled with amazing artwork in a format that is the ultimate tribute to AW. You will always be the real WINNER Andy. Glen and I will never forget our introduction to your ambitious and mind boggling project in its early days at The Rheged Centre. Our copy will always be admired and treasured. Best wishes for 2019, Ed Whitaker. Yes, the fact that they have taken the move to actually list my book and purchase it via the wholesalers is something of a seal of approval. I intend to try and work it in my favour. Thank you for then kind comments and support. Thank you Phil, that is appreciated. Thanks for taking the time to comment. Yes, in cases such as yours I understand that the actual photogrpaher makes very little money from such licensed sales, indeed it is simialr to authors who are published by big companies the going rate seems to be a paymetn of about 10-12% of the cover price. I am fortunate that I get a higher return but then I did take a huge gamble on self publishing but it does mean that I can control the market to some extent.